The style you are learning has its roots in China where the Kung Fu style from the famous Shaolin Temple was combined with another fighting system. This martial arts system found its way to Japan and today is known as Goju-Ryu or Goju-Kai. In Japan it evolved into two separate disciplines in Okinawa and on the mainland. Go-ju has several meanings depending on how the characters are interpreted. One of the most favored interpretations is Hard/Soft and relates to the style's use of hard direct force combined with economy of movement and the redirection of the opponent’s force (soft). Our style follows the way of Goju-Kai as it was taught on the mainland. Sensei Miyagi is credited with being the founder and he taught his techniques in prewar Japan. Several variations and sub-styles came into being immediately because he taught his students differently to take advantage of their body types. Today the differences amongst sub styles, and indeed styles, are not as noticeable due to the interaction among groups and are most prevalent in each group's interpretation of kata. After Miyagi's death Gogun Yamaguchi (the cat) became the head of the organization. In the early 1950's political infighting caused him to be expelled from the organization and he continued on with his own group that today is known as International Goju-Kai. Infighting would prove through the years to be as much a part of the Goju Kai as karate. After various name changes the remnant of the original group is today known as the Japanese Karate Federation Goju-Kai. Takeshi Uchiage moved to Richmond, B.C. as part of a sister city agreement with Wakayama Japan in 1973. Eden Hampson who had started karate training in the RCMP in 1971 heard of the school and started training Goju Kai in early 1974. In 1975 he was transferred to Edmonton and instruction decreased to only occasional visits from his instructor and his instructor's father. In 1978 Takeshi Uchiage moved to Edmonton, where he remained until 1984. A club was started at the City Police and Art Adamson was one of the first to join. Like Eden, he had been involved in the martial arts since the early 70's and had practiced Judo and Kung Fu. Glenn Iriye joined in 1979. Training in the early days was brutal. No protective gear was worn (not even tooth guards or cans) and a lot of the time it was closer to full contact than controlled contact. A broken toe for each kyu level was the norm. Other broken parts were optional. In July 1980 Eden obtained his black belt during international competition in Nagoya, Japan. Shortly thereafter Art received his Shodan as well. Glenn was promoted to black belt in 1984. All three continued to train hard, forming a natural alliance in the club. The instructors known to you as the Canadian Goju-Kai were all black belts in the latter organization until May of 1990 when they decided to part company with the J.K.F.GOJU-KAI’S head instructor for Canada, Takeshi Uchiage. The clubs as they exist today started in 1984 when Eden Hampson, Art Adamson, and Glenn Iriye decided that they were prepared to open clubs and continue teaching. 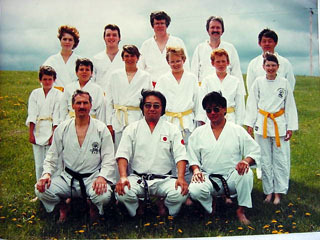 The Trinity Go-Ju Kai karate club began in November 1984 as Christian outreach program founded by Sensei Art Adamson. This club is a Christian and family orientated club with a mission statement: "Improve your vessel as a receptacle for the Lord." Each lesson is opened with a prayer, a religious reading, and closing prayer. The club was founded with the intention of bringing the art of Karate to the community of Sherwood Park in a non-denominational setting. Sensei Art requested assistance from Sensei Glenn Iriye and the two of them built up the club over next 25+ years. One of the basic concepts of the club was that it would be a non-profit club surviving wholly by the fact that the instructors volunteer their time. The Trinity Baptist Church supported this concept and provided the club space to practice free of charge. The club provided 50% of its donations back to the church as a donation in return. This strong relationship continued until 2003 when the Trinity Baptist Church realized that they needed to renovate to accommodate the growing requirements of its congregation. The karate club needed to find a new location to practice. The Sherwood Park Presbyterian Church opened its doors in true Christian fashion and we enjoyed a short-term but much needed location to practice. While the club enjoyed practicing at Presbyterian Church the space that the church had at its disposal was not sufficient for the karate clubs needs. One of our members that attended the Sherwood Park United Church facilitated a meeting and we moved our club late in 2003. While we continue to operate as a non-profit club we had to make a change based upon the move. We rent the practice space from the Sherwood Park United Church at a modest cost. To ensure that we meet our financial obligation we are required to charge our members a modest fee for attending class. Our instructors still hold true to the goal of teaching for the sheer enjoyment of passing the knowledge onto our new members. In 2008 we had the opportunity to again move to a larger area and in April 2008 we moved into and adopted the Strathcona Christian Academy, Elementary School gymnasium as our permanent home and dojo. While the Trinity Go-Ju Kai karate club was searching for a new home a club member suggested that the club practice out of the Tipaskan Elementary School. The karate club decided to stay within Sherwood Park as the parent club however it was decided to open a new club within Tipaskan. 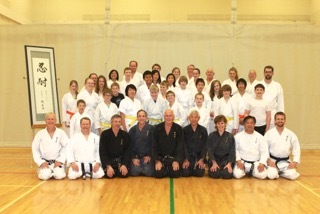 The main instructor is Senpei Trevor Dymchuk with occasional visits from Sensei Art Adamson. This club catered to the students and their families in the area, and due to other commitments Senpai Trevor had to forego teaching there. Trevor was promoted to Sensei in November 2007. 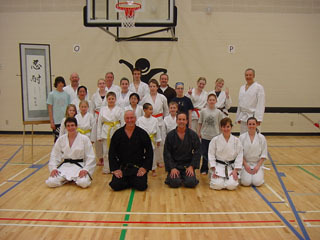 Originally, the West End club was operated by Sensei Glenn Iriye as a service for students living in that area to provide these students with an opportunity to train during the week. This training was provided for many years at his home and in a school gymnasium on an invitational basis. In September, 2004 training at Laurier Heights School was opened to the public. 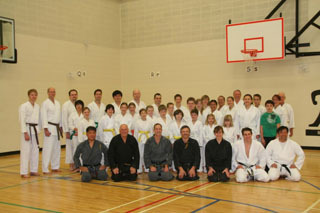 This move expanded the membership to include new students instead of being limited to Trinity Go-Ju Kai students who attended the Sherwood Park dojo. Again due to promotion Sensei Glenn had to finish his committment to the West End Club, some students then traveled to the Trinity Club in Sherwood Park to further their training; showing a great commitment to the Art. One of Trinity’s senior students, 1985 – 1996, after completing his University degree in Education accepted a teaching position in Fort McMurry. In 1998 Senpai Scott BARR, sho dan, was given leave to open a Club within his school. He adopted the teaching practices of the Trinity Club, being non-profit. Presently he teaches Tuesday evenings and Saturday mornings at the Ecole Dickenfield School. Due to his commitment to the style he was promoted to Sensei in 2008. Another senior student, Peter LASCHUK, 1990 – 1999 after being promoted to Sho Dan in 1999 moved to Red Deer. He also was give leave to open a Club, and practiced in that city till 2006, when an illness in his family prevented him from teaching any more.